Kilauea Volcano is the most active volcano Hawaii has known in the modern era and one of the most active volcanoes in the world. While three of the five Hawaii Island volcanoes are active, no volcano on earth has erupted as consistently in the past century as Kilauea. Hawaii legend says that Kilauea Volcano is home to Pele, the Hawaiian goddess of fire and volcanoes. 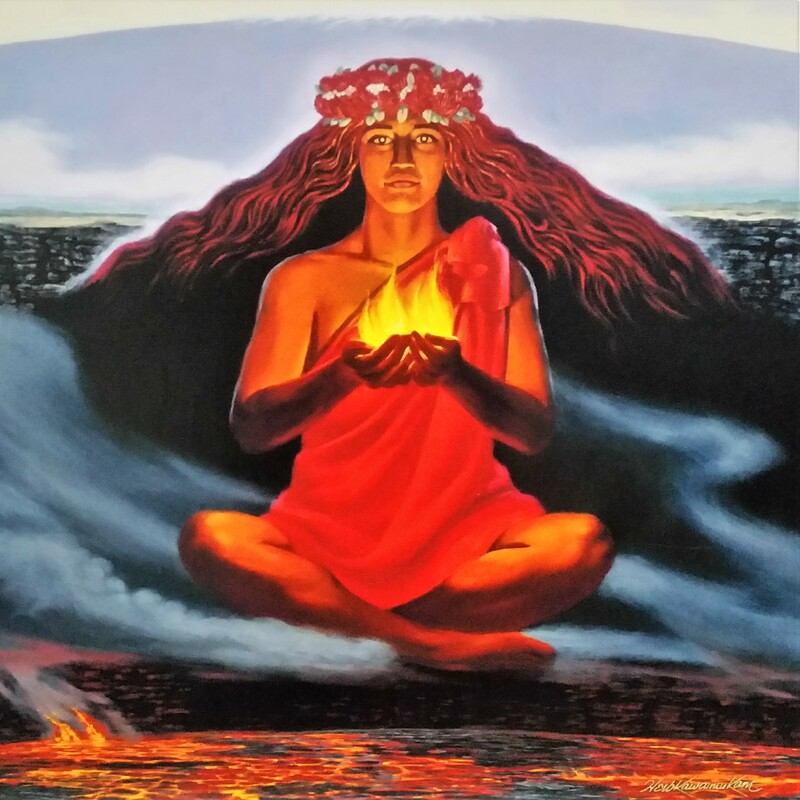 A well known and highly respected deity in Hawaiian mythology, Pele is also called Ka wahine 'ai honua, "the woman who devours the land". Her home is said to be on the summit of Kilauea in the Halema'uma'u crater. But more than legend, this Big Island volcano is one of the most famous on the planet due to its frequent activity. Kilauea has been erupting continuously for more than 30 years. In the last 1100 years, this Hawaiian eruption has covered more than 500 square miles (1,300 square km) of the Big Island with lava. This Kilauea eruption has been adding new land to the Big Island continuously since 1983. There have been very few interruptions in its activity over the past two centuries. In fact over the last 100 years, Kilauea has been erupting almost half the time. Read more about how the Hawaiian Islands were formed. Most of the eruptions on Kilauea are occurring along the eastern flank of the volcano, the east rift zone. A rift zone is a feature that is characteristic of shield volcanoes, where a long series of cracks or fissures in the lava allow eruptions from the side of a volcano rather than its summit. The current Kilauea eruption is called the Pu'u 'Ō'ō eruption, named for the vent along the east rift zone from which lava is spewing. Since the Pu'u 'Ō'ō Crater began erupting on January 3, 1983, its lava flows have destroyed over 180 structures (mostly homes, but also churches and native temples [heiau]). 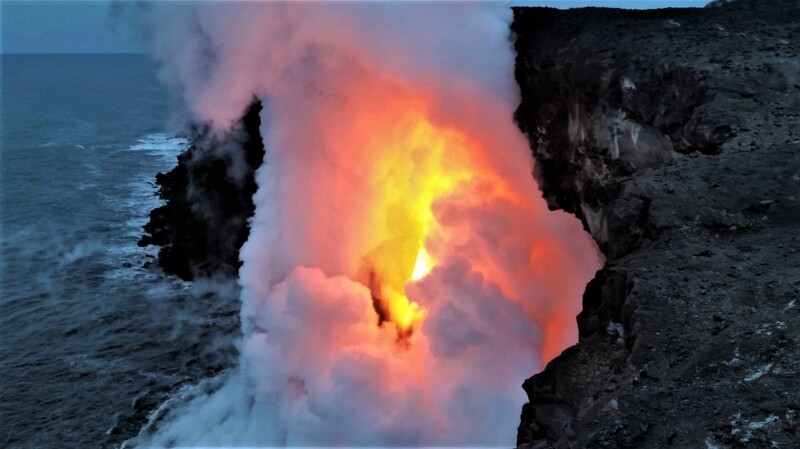 While most of Kilauea's eruptions have flowed southeast toward the ocean, on June 27, 2014 a new outbreak along the northeast flank of Pu'u 'Ō'ō began flowing northeast. By late October, 2014 the flow had entered the town of Pahoa. The lava continued to advance slowly, and on November 11, 2014 the first home was destroyed. That flow has currently stopped. Much of the information that follows predates the 2018 Kilauea eruption. Extreme earthquake activity in the spring signaled an impending change when Kilauea's Halema'uma'u summit crater collapsed and lava vents began bursting open in new areas on the east side of the Big Island. In June, Kapoho Village, Kapoho Tide Pools, and Ahalanui Beach Park were buried under heavy lava flow that has now extended the coastline. Heavy earthquake activity closed Hawaii Volcanoes National Park for four months in May, 2018. 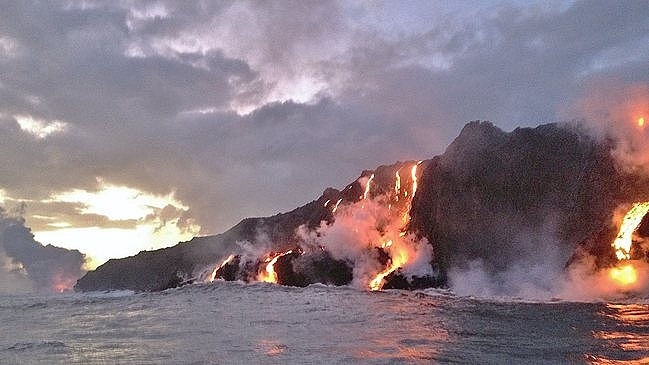 For those wishing to see the dramatic spectacle as lava meets the ocean, there had been no active lava ocean entry on the Big Island between August, 2013 and July, 2016. 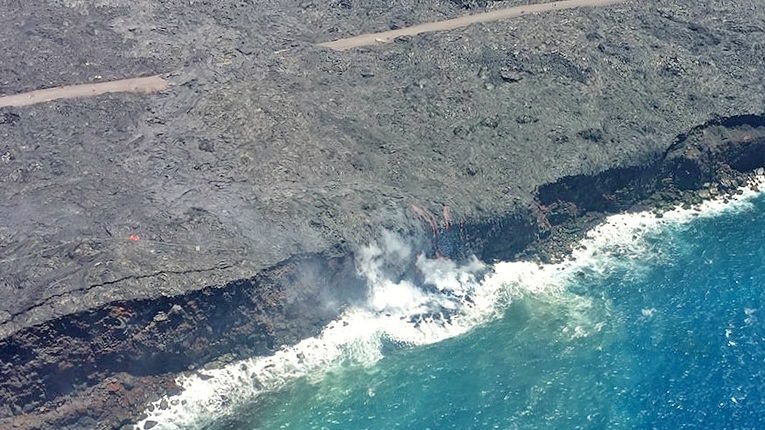 Then on July 26, 2016, lava that had been flowing southeast of Pu'u 'O'o crossed the southern emergency road and entered the ocean at Kamokuna, near Kalapana. New land is being added to the Big island for the first time in nearly three years. 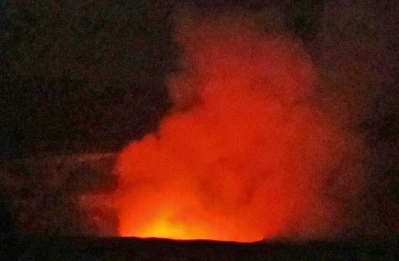 There is no way of knowing how long the lava ocean entry will last, but for now volcano goddess Pele is putting on quite a show! Use extreme caution if you hike out to witness the impressive display. The easiest access is from the east side of the flow, south of Hilo at the end of Highway 130, near Kalapana. Drive to the end of Hwy 130, park your car and plan to hike about 4 miles each way (6+ kilometers). Bicycle rentals are also available. Wear closed-toe sandals, running shoes, or boots, NOT slippers (flip-flops). Be sure to bring plenty of water, sunscreen, and a headlamp if you plan to arrive before daylight or stay after sunset. Visit the National Park Service Kilauea current conditions for today's most current information on Kilauea's active lava flow. Hawaii Volcanoes National Park is a great starting point for exploring Kilauea and the entire area around the Kilauea volcano. The Kilauea Visitor Center is located roughly 45 minutes south of Hilo and just over two hours from Kailua-Kona along Highway 11. Stop here to familiarize yourself with the amazing sights of the park. On Crater Rim Drive, drive west a couple of miles from the Visitor Center to the Kilauea volcano overlook and Jaggar Museum, adjacent to the Hawaiian Volcano Observatory. The museum offers fascinating information on not only Hawaiian volcanoes, but also volcanoes around the world, as well as seismology, history, and Hawaiian legend. During the day, the dry lake-bed of what was once an enormous reservoir of molten lava is visible spreading out below you. This is the Kilauea Caldera. A caldera is a bowl-shaped depression that is formed when an erupting volcano empties a sub-surface chamber of magma. The structure above the now empty chamber collapses, forming a steep valley. The Kilauea Caldera is 2.5 miles (4k) long and 400 feet (122 meters) deep. 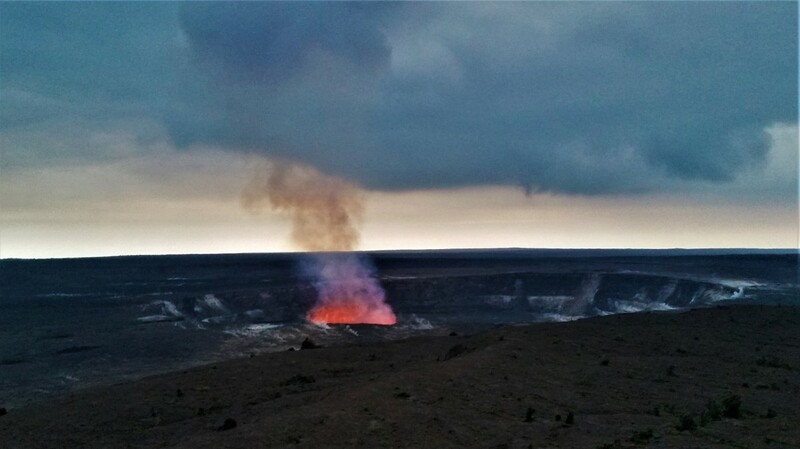 A plume of sulphur dioxide gas billows out of the center of the Halema'uma'u crater within the Kilauea Caldera. Halema'uma'u represents what remains of the magma chamber that, when emptied, formed the Kilauea Caldera. 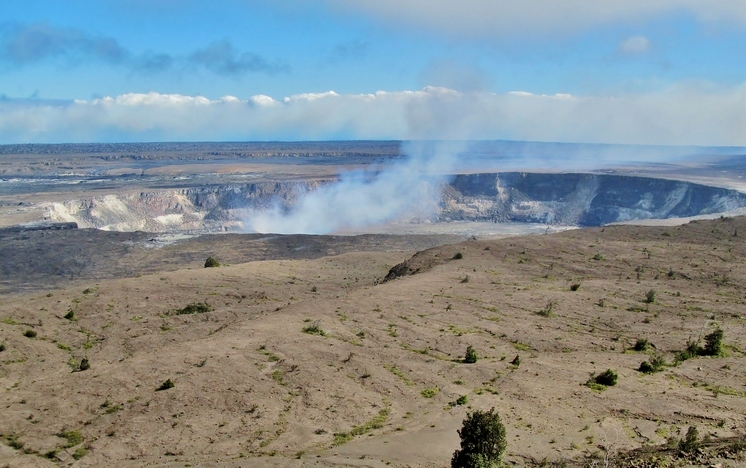 The Halema'uma'u Crater is 3000 feet (914 meters) across and nearly 300 feet (91 meters) deep. Recent eruptions have filled the crater floor with lava, steadily decreasing its depth. What is the source of the smoke and gas? Just out of sight over the edge of the crater lies the lava lake, a bubbling, oozing mass of fiery hot liquid emanating from the earth’s core. Imagine: you are standing atop perhaps the most active volcano Hawaii will ever know. 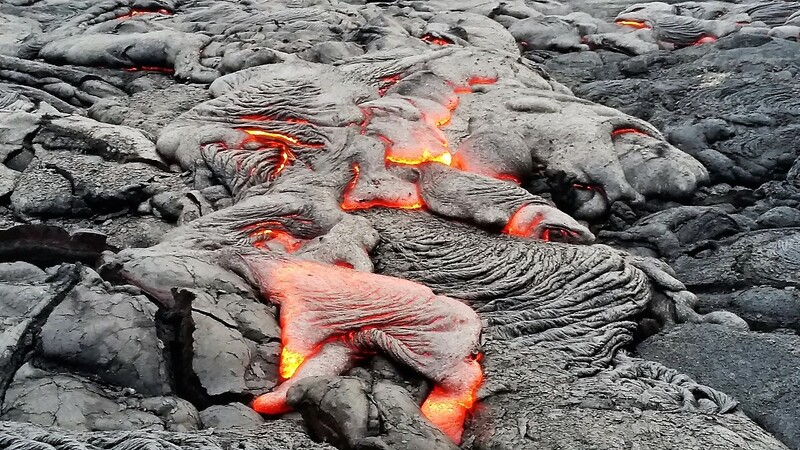 The lava level inside Halema'uma'u Crater is typically 100 to 200 feet (30-60 meters) below the floor of the crater. In April, 2015 the level of the lava lake had risen high enough to spill onto the floor of the crater. When Kilauea's sulfur dioxide emissions mix with air, dust and water particles, the result is what is known as vog, or volcanic fog. Winds can push the vog more than 50 miles, accounting for the frequent haze in and around Kona. Part of Crater Rim Drive within Hawaii Volcanoes National Park is often closed due to dangerous sulphur dioxide emissions. At night the show inside Halema'uma'u is even more spectacular! The Kilauea eruption is most evident when the sky is dark, as an orange glow emanates from the fiery furnace within Halema'uma'u Crater, easily visible from the overlook at the Jaggar Museum. Hawaii Volcanoes National Park is open 24 hours a day, so if you happen to be in the area in the evening we recommend an after-dark trip to the overlook. In addition to her persistence, one thing that makes Kilauea so fascinating is the ease of access. Consider that you can literally drive to the edge of the summit crater or hike to the bottom of the Kilauea Iki Crater to the east! Speaking of hikes, there are many in the vicinity of the Kilauea volcano. Our favorite hike in the area is the Kilauea Iki loop. This hike has it all, from lush rainforest thick with tropical flowers and gargantuan tree ferns, to the mysterious ancient floor of the Kilauea Iki Crater. If you prefer to travel with a guide, sign up for our private Kilauea Volcano tour, offered daily from both sides of the island. The full-day tour includes pick up at your hotel or local address in our luxury SUV, a fun day exploring all the sites in Hawaii Volcanoes National Park, snacks and cold drinks. We can include hikes and additional stops according to your interest and offer suggestions for a lunch stop (lunch not included in tour price). We will customize your tour based on what you'd like to see and how adventurous you are. Starting at just $295 for two people out of Hilo, $325 for two out of Kona (only $50 each additional traveler). Sign Up Now to secure your preferred travel date. Expect variable weather on this part of the island. It can change quickly from hot and sticky to cool and damp. You may be bundled in a rain jacket one moment, wearing only a t-shirt in the hot sun a few minutes later. 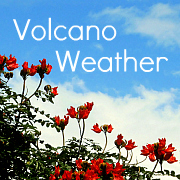 Mauna Loa is of course another active volcano Hawaii is known for. Because of the difficult access, recording the actual eruptions has been historically challenging. That mammoth Hawaii volcano last erupted for three weeks in 1984.